Okay first and foremost this is not the video I promised when I re-ran the Training the Obese Beginner series. That was just going to be a lot of ranting and raving and as much as I enjoy that wasn’t going to be terribly productive so I decided to ditch it. Today what i want to talk about is a question that does come up quite frequently, usually among the more general fitness folks who are doing a good bit of weight training, getting stronger or bigger but then decide that for some variety they want to do an endurance event. Typically that’s a marathon or half marathon; if they are more into bicycling they might ride a century which is 100 miles. Lately there seems to be more interest in things like the Tough Mudder, things of that nature. The point being that since they aren’t concerned with maximizing their bodybuilding or strength training, they want to go do something very heavily endurance oriented and what they want to know is what’s the best way to keep their gains in the weight room while they do that. I’m mainly going to focus on that; what I’m going to talk about really isn’t about weight training for endurance athletes although a lot of what I’m going to say is fairly similar to the recommendations I’d make there. Now there’s a lot of beginner marathon and century programs online; I’ve linked out to some of them in the text underneath this video. Hal Higdon, Jeff Galloway are some of the big running coaches; there are a variety of Century approaches. They all tend to take the same basic format. 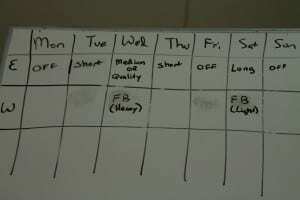 Which is you see three shorter workouts during the week and then one very long workout on the weekend. For running, typically three shorter runs during the week, that one long run on Saturday. For cycling you often see a little bit higher frequency since just because it doesn’t beat you up so badly. But I’m going to sort of work from that template. During the week the runs might be 3,4,5 miles tops; Wednesday you might see a little bit longer run sort of a medium distance. 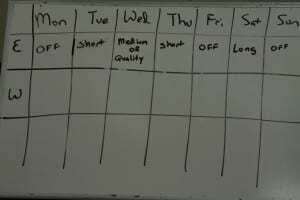 Or some programs will have some quality work; by quality work we’re not talking about full sprints. It might be mile repeats a little bit faster than race pace. Some people just keep it slow and a little bit higher volume. The Saturday workout is the long run and that is really where the energy is supposed to go. Running programs start with 5 or 6 miles and might build up to 20 miles by three weeks out; so about 80% of that total distance that they are going to finish in the marathon. Century programs look basically the same, workouts are a little bit longer since cycling workouts tend to be about twice as long (as running). So you might see an hour bike ride a few times during the week; some people recommend a harder ride on that Wednesday. And then again you’ve got a long bike ride on Saturday. It might start at 35 miles and add 5 mile as week so you’re doing 75-80 miles by a couple weeks out from the event. Every once in a while you will see a program that recommends working to the full race distance in training; it kind of defeats the purpose. Most people want to do the marathon, do the century to get the t-shirt, get the medal and accomplish the distance in the event. And doing it in training really isn’t that useful. 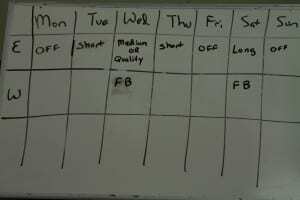 A basic weekly schedule to complete a marathon or century. So I’ve shown that basic approach in the picture above. 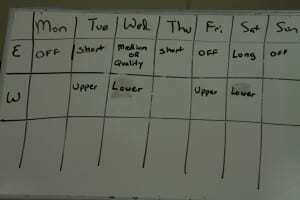 Again you can see the three shorter workouts during the week and that one long workout on that Saturday or Sunday; it sort of depends on what’s better for you. Where to Put Weight Training? Ok, so with that in mind let’s talk about where to put weight training. The big issues with weight training; of course the first one is that people want to maintain their size and strength gains. Whether or not that’s realistic against this volume of training is debatable but done properly you can maintain certainly most of what you gain without a whole lot of losses. Another issue is that you have to be real careful with where you program the weight training so as not to interfere with the (endurance) training itself. Again that long workout on Saturday is really the big one. You don’t want to go into that tired; that’s the key workout for all these programs. The Wednesday workout whether it’s a little bit longer or a little bit harder is another key workout so…since running and cycling are both beating up on your legs you really do not want to put weight training before either of those days. Coming into those fatigued is a real danger. Running on tired legs is also a really good way to get hurt. So what my typical recommendation is is number one to cut weights back to twice a week. When you’re trying to do a high volume of endurance training, there’s just not room or recovery for much more than that. And with that I would recommend two full body workouts. Typically I would actually recommend doubling up on the harder days. So do one full body workout on Wednesday after the longer run or the quality run or the longer bike ride. And then the other weight workout on Saturday after the long run or ride. The key being AFTER. This assumes that your schedule will allow it; I know that not everyone has that kind of flexibility but that would be kind of the ideal. This way, it does make for two really hard days. You’ve got that longer run on Wednesday or the harder run/bike ride plus weights and then Saturday is just a hellish day. Endurance schedule with two full body workouts shown. But it gives you the most recovery for your legs given the other training. 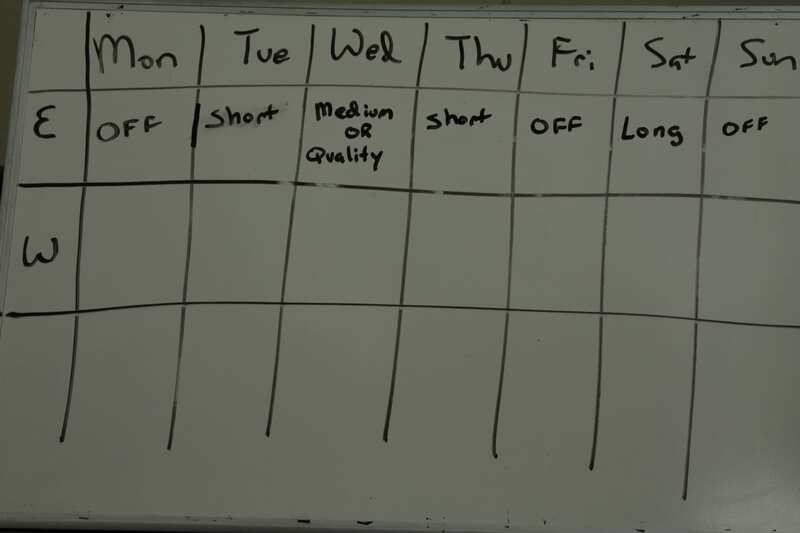 Since you also get Sunday off, Monday off, you get the most recovery from Saturday. Mind you, not everybody likes full body routines. They kind of come in and out of vogue; I’m a big fan of them. Not everybody likes them. You can do a basic split routine. Again the key is to really be careful not to do heavy leg work before either of the important bike rides or running workouts. So I’ve shown another split sort of a basic upper/lower split routine. Again, with the lower body days falling on those heavier run or bike days and then the upper body days kind of scheduled separately. So those are kind of the two basic options. You can do two full body workouts, hopefully after your heavier running or cycling days or you can do as basic upper/lower split routine if you’ve got the recovery and your schedule will allow it. That just depends on you. Before I move on let’s talk a little bit about programming. the key thing to maintain both strength and size gains here is that you’re going to want to cut the volume of your weight training workouts but maintain the intensity. By intensity here I really mean weight on the bar; I’m not talking about percentages of one rep maximum. Effort, yes and no. The key thing is to really keep the weight on the bar as similar as humanly possibly to what you were using beforehand. The rule of thumb and this has been shown in research to be true and empirically/anecdotally is that you can cut your volume pretty heavily, by up to about two-thirds as long as you maintain intensity. Again, weight on the bar. So if you were doing 5 sets of 5, you can cut back to 2 sets of 5. If you were doing 4 sets of 10, you can cut back to 2 sets of 10. You get the idea. That will really be ideal for most people. Go, couple of warm-up sets, couple of heavy sets and then be done. For lower body, keep it simple. One compound for exercise for quads, one leg curl exercise or hamstrings. Maybe a secondary exercise, little bit of upper body and get out of the gym. You can make full body workouts different so one day is more quad emphasis and one day is more hamstring emphasis. You know the drill on this. Again the volume and keep the intensity high. The same thing goes for the upper/lower. Cut your volume on everything. Upper body is involved in both running and cycling; if you wreck your upper body in the weight room, you’re going to have a bad time on the harder run or bike workouts. One other thing, this is really more for that full body option but can also go with the split routine is that you may even find you have to do a heavy/light routine or a heavy and a speed day. So you might do your heavier workout on Wednesday after that hard(er)/medium/faster bike ride (or run). So you won’t be too wrecked, go to the weight room and that’s really the time to keep it heavy. Then on Saturday you’re going to be wrecked if you go ride for 50 or 60 miles on the bike or run for 15 or 20 miles. Your legs are going to be tired. Go in, do a power workout, about 80% of the weights you used on Wednesday on the full body, on the heavy day. Keep it short, get out of the gym. Endurance schedule with a heavy/light full-body approach. I would also mention that, on Saturday, after you do that long-ride or long-run you’re going to need to do some post-workout nutrition if you’re going to have any chance of doing anything in the weight room. It’s also ideal if you can put about 4-6 hours between the workouts. 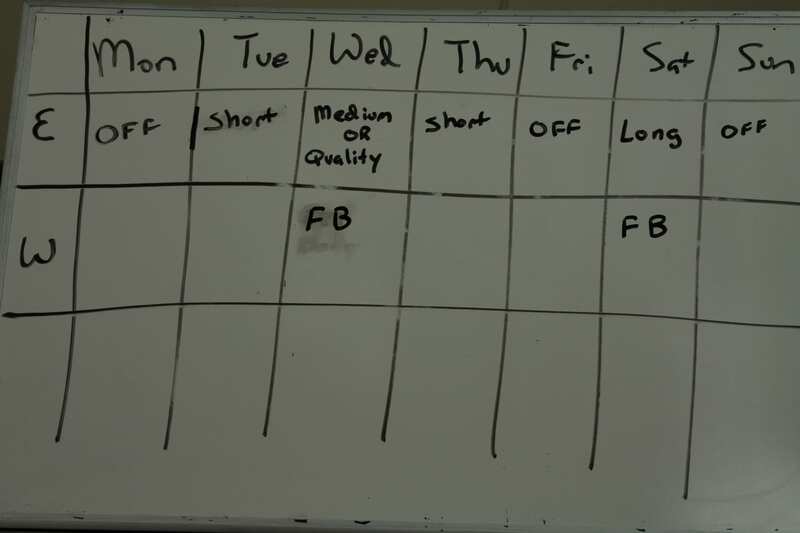 Your schedule may not allow it but that’s kind of the ideal. So that’s sort of an overall look at how you might best combine weight training with these types of endurance training goals. Do know that even if you do lose a little bit of strength or a little bit of size, as soon as you cut back that training volume on the endurance stuff and get back to it in the weight room…muscle memory is real and it will come back pretty quickly. 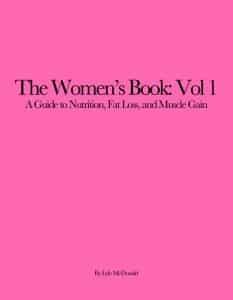 So you can read the transcript on this and get some links to some programs if you’re interested to different marathon or century programs and the graphic are there too at www.bodyrecomposition.com. Thank you. Addendum: I got a question about this piece to the effect of “How many people have the time to go to the gym twice a day. What about other (even less optimal) options ?” that I should have addressed originally (I’ll chalk this up to still working out the best way to do videos). 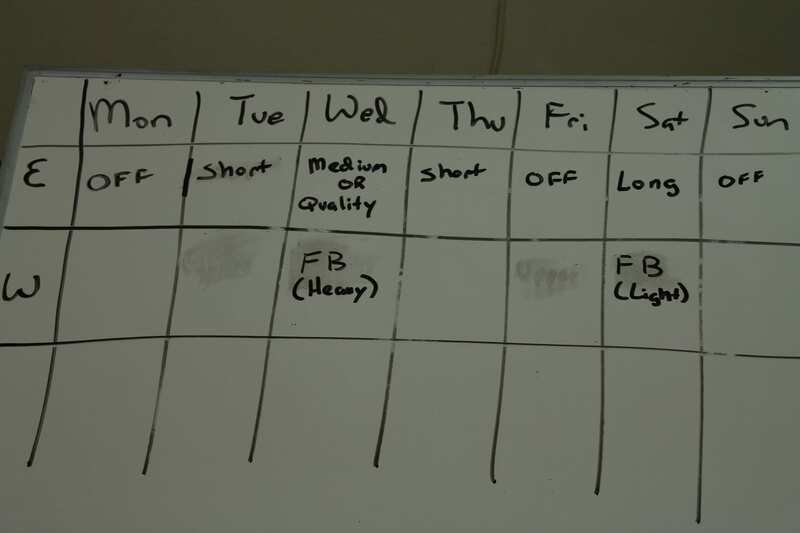 In this situation, probably the best way to approach it would be to stick with the two full body workout approach and put them on the off days Monday and Friday using the heavy/light approach I discussed in the video/main article. 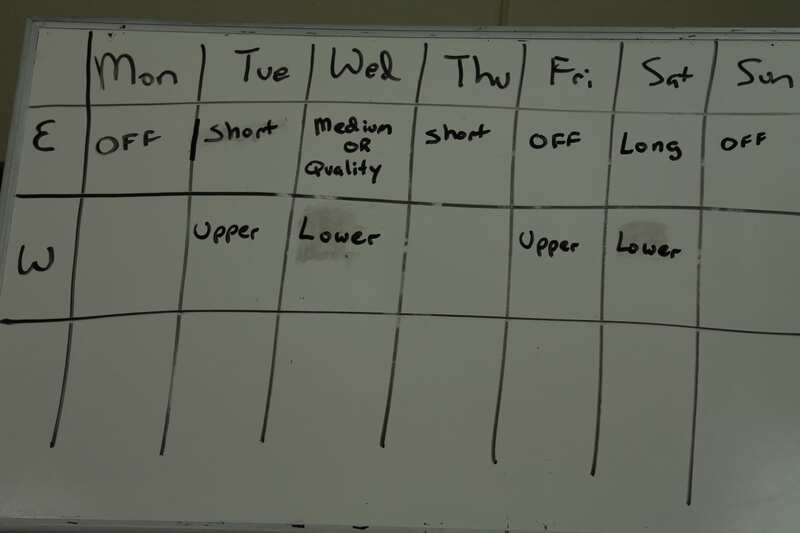 Monday would be the heavy day since the Tuesday workout is short/easy and even Wednesday isn’t too bad. Lifting on Friday before the long run/bike isn’t ideal but so long as the intensity is kept sufficiently low (75-80% of the heavy day and far from maximum), it’s workable.